A co-worker I use to work with is headed for a great adventure. She got a job in Barrows, Alaska ! Woo Hoo!! Before she leaves Oregon she wanted a luncheon with some of her co-workers. 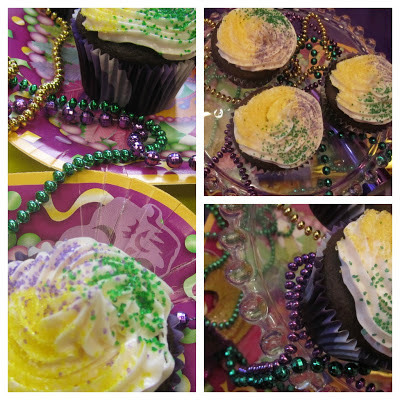 Being Mardi Gras and me being a Party Diva, I had to Fizzy up the Bon Voyage luncheon. Since it was at work I can't go ALL out like I'd like too. I have to make due with the room layout and be able to decorate on a 15 minute break. I Fizzy'd up the white board with Mardi Gras essentials. Beads, coins, noise makers and the masks I made last year. (click the link for a how-to). Better look at the masks I made. I decorated the whole table with masks, noise makers, beads, coins and my signature...confetti! You know I had to have cupcakes. Chocolate cream filled with the Mardi Gras colours represented in sprinkles. No cupcake survived. I look forward to hearing about my friends adventures. It was - 15 in Barrows today by the way, brrrr. Love the Mardi Gras "flare" stuck to the white board. You did a great job making due with limited time and resources. And those cupcakes look spectacular! Thank you Stacy. Everyone enjoyed it and it added some Fizz to our day :) I used the Fun-Da-Middles for the cupcakes because the party was on short notice. People really liked them. That was definitely the funnest room in the building that day!